How can I change my app's header, menu icons, header color, and icon colors ? Click ‘Save and Go Live’ on the screen. Go to Choose A Theme. 4. Go to Menu Layout - iOS and select the Bottom Menu. 5. 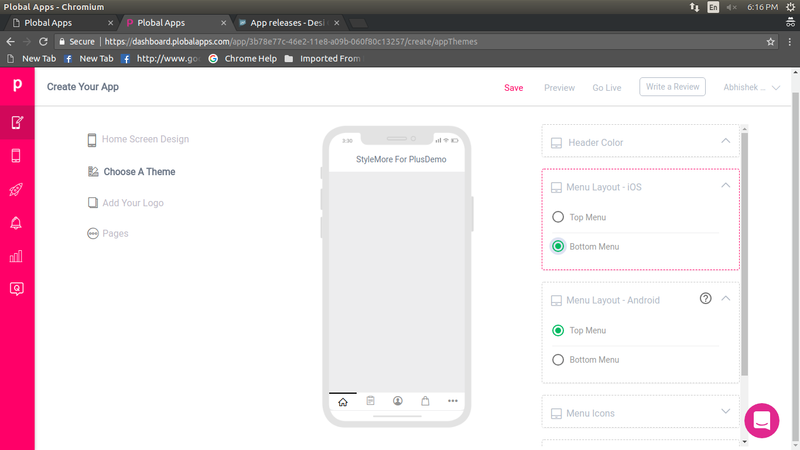 Go to Menu Layout - Android for Android app. 6. Press Save & Go Live. Scroll down & open Feature Label section. 4. You can change text on the header on each screen. 5. Press Save & Go Live. 4. Select header color or add a color hex code. Press Save & Go Live. 5. Scroll down & open Menu Icons. 6. Select the icon for 5 tabs which are Home, Categories, My Account, Cart & More respectively. 7. Press Save & Go Live. If you need further assistance then please create a support ticket here.